Google Plus is a growing social media platform like Facebook & Twitter that allows you to promote your business, product or organization to a wider audience for free. The Google Plus community is increasing rapidly and it makes promotion of your business easy, simple and straightforward. A Google Plus page can help you in reaching the wider audience with a single post. In this post, I am going to guide you to create a perfect Google Plus page for your small business. Just like Facebook, you need a personal profile on Google plus to create a business page. If you don’t have any then first of all create your personal profile at Google+ and then proceed with the following steps. Setting up Google Plus page is very simple and easy. You can start this process by visiting Create a business page on Google Plus and locate the “create a page” button. Click over targeted new page creation button and you will be directed to set up process. Choose the category of your business in the first step. Always go for the category that describes your business to its maximum. You can pick your category from the options like product or brand, local business or place, institution or organization, company, brand, arts, sport and entertainment. If none of these categories meet your business’s nature then choose “other” category. 2-The second step in this process is based upon the main category you choose. In this step you will be presented with different type of sub categories that are perfect for describing your small business into greater detail. For example, if you opted for “company or brand” then you will be asked to enter your phone number and location/address of your business. Finish this step by selecting your category and click next to enter new steps. 3-Add info page allows you to add a detailed description of your business along with basic details like phone number, email or website address, location, services and other things. This step begins with choosing a perfect name for your page and adding link to your official business website (if any). It is not necessary to enter an external link to your business website but a good website with detailed description of your business puts great impact over your overall business image. The next step in this process requires you to choose the kind of content you are going to display on the page. You can choose from content for “any Google Plus user”, “Under the age of 18”, “21 or above 21 years of age” and content related to alcohol. The final step in this process requires you to check “I agree to the Pages Terms and I am authorized to create this page.” I highly recommend you to check Google Plus Terms and conditions before checking this option. Once done, click next to proceed with customization of your business Google Plus page. 4-Customization of your Google Plus business page begins with adding cover and profile photo. You can click over the default profile picture to add a photo to your profile. You can choose any photo from your computer and upload it to your Google Plus profile. Google Plus also allows you to add photos from your Picasa account (if you have one). 5- Same procedure is required to change the cover photo of your Google Plus business page. Cover picture is normally larger than profile picture and that is why it is perfect to display your mainstream products or service via an impressive cover photo. 6-Under story section, add the best 10 words tag line for your business. Be careful while writing this short tagline as it plays an important part in setting up an image of your business at least in Google Plus world. Try to be consistent with the tagline that you have already used for promotion of your business at other forums. In the end, add contact information of your business including phone number, email address, chat id, Skype, Pager, fax, mobile number and other important details. Once done, click finish to complete this step. 7- Once you are done with adding basic information of your business, now you are headed up to the main control panel of your Google Plus page from where you can control everything. Use “about” section of control panel detailed information about your business. 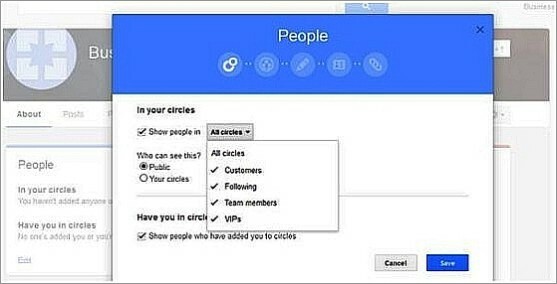 “People” area allows you to determine how Google Plus users may see your business page. You can categories your page fans into different categories like customers, following, VIP’s & team members. You can also check that who has added your business page to their circles and you can also follow them in return as well. Now move towards “Story” section to edit intro about your business. Include an impressive intro of your business by clearly defining what your company do and for whom? Using important keywords related to your business in this section is very important. Once done, add links to your other social media pages like FaceBook & twitter. You can also add links to sites and pages that are related to your business to increase exposure of your company. 8-Once you are done with editing and creation of your Google Plus Business page, you can start sharing posts, videos, links and photos with your customers, fans and followers. The process of sharing content on Google Plus business page is similar to the one you use while sharing content on Facebook or your Google Plus personal profile. Add informative content in your posts and make them engaging for your readers by adding video and images related to the topic. 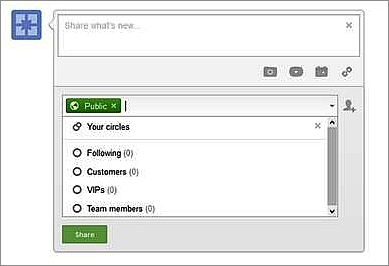 In order to make interaction and engagement of your followers/customers on your page easy and simple, Google Plus offers you with quick link tabs at the bottom of your page. 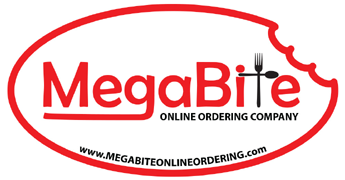 These tabs include “about”, posts, videos, links and other information about your business. These tabs are visible to all the Google Plus users (by default) so you must make sure that you have enough information to share with your visitors. 9-Its easy to check that who has added you to their “circles” and you can always check it by clicking over “Circles” on the left sidebar and then click “more”. Display screen allows you to divide your fans into four different circles. You can also add other people in your circles. One advice from Google Plus experts is that do not keep on advertising or promoting your products on Google Plus business page. Try to teach your customers by adding informative content related to your niche. 10-You can also use your Google Plus business page to add data to your Google Local Plus page. Have you got any suggestions to improve Google Plus business page? Share them with us in the comments.